Jiangsu NOVA Intelligent Logistics Equipment Co., Ltd.
3.the frame is assembled by uprights and bracings and beams are fixed to uprights by hooks. 4.There are safety pins to fix beams and uprights tightly, protecting beams from dropping when loading goods with forklifts. 5. The height of each layer can be adjusted by 75mm or 76.2mm freely, the capacity of each layer can be up to 4000kg. 7.Such forklifts as front-move forklift,balance-weight forklift,common forklift and stackers can be used to load and unload goods. 8.Steel panels, wooden panels and mesh decking are also available for putting on beams instead of pallets directly. 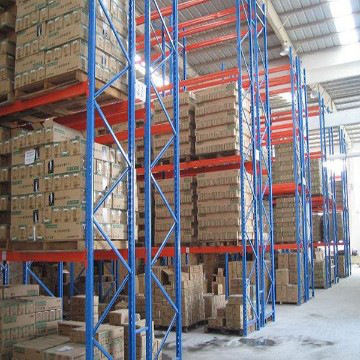 Pallet racking is the most common storage system which is used in fields of manufacturing industry,the third part logistics,distribution centers,supermarket and so on. 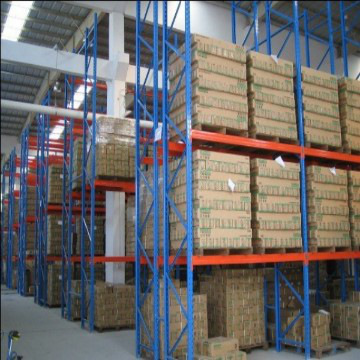 9.Pallet racking is the first choice when building High position warehouses and AS/RS System. We are professional manufacturer of all types of Racking system since 1997, and are the 1st supplier to Toyota in UA.E.,Oman and Saudi Arabia since 2004.We can guarantee our best quality,competitive price and after-sale service. We would like to be your reliable supplier and trusted friends.Thank you for your attention! If you have any concern or questions, kindly contact me,we all help you out asap. Plastic films used to pack rack items and wooden crate or cartons used to pack accessories. Established in 1997, Jiangsu NOVA Intelligent Logistics Equipment Co., Ltd. has developed into a middle-scale group with three domestic factories and a joint venture. Our company is a manufacturer of racks, logistics systems, and multi-layer warehousing systems.During the past eleven years, our company has been dedicated to planning, designing, producing and installing logistics systems and automatic stereo warehouse facilities. Now, our annual turnover exceeds USD12, 400,000.Meanwhile, we employ a group of skilled engineers engaged in the design and development of logistics systems. Now, our company is equipped with tens of automatic logistics system production lines. With six patents, we have become a famous company in China. In 2001, our company achieved the ISO9001 certification, ISO14001 and ISO 10012 and so on. During the past eleven years, we have carried out thousands of projects on big storage racks and stereo warehouse facilities. Our main projects include Toyota Saudi parts logistics center, products warehouse of Japan Kao Corporation, Yangzi BSF Company parts warehouse, and Guangzhou New Baiyun International Airport logistics center.Following the quality strategy of "Designing space, exceeding expectation, manufacturing carefully and the same of inner and outer", we will provide our clients high quality products with excellent services. Please feel free to contact us or visit our website. Factory Info: Jiangsu NOVA Logistics System Co., Ltd.
Boqiao St.,Jiangning Town, Jiangning Dist. Established in 1997, Jiangsu Nova Logistics System Co., Ltd. has developed into a middle-scale group with three domestic factories and a joint venture. Our company is a manufacturer of racks, logistics systems, and multi-layer warehousing systems.During the past eleven years, our company has been dedicated to planning, designing, producing and installing logistics systems and automatic stereo warehouse facilities. Now, our annual turnover exceeds USD12,400,000.Meanwhile, we employ a group of skilled engineers engaged in the design and development of logistics systems. Now, our company is equipped with tens of automatic logistics system production lines. With six patents, we have become a famous company in China. In 2001, our company achieved the ISO9001 certification,ISO14001 and ISO 10012 and so on . During the past eleven years, we have carried out thousands of projects on big storage racks and stereo warehouse facilities. Our main projects include Toyota Saudi parts logistics center, products warehouse of Japan Kao Corporation, Yangzi BSF Company parts warehouse, and Guangzhou New Baiyun International Airport logistics center.Following the quality strategy of "Designing space, exceeding expectation, manufacturing carefully and the same of inner and outer", we will provide our clients high quality products with excellent services. Please feel free to contact us or visit our website.